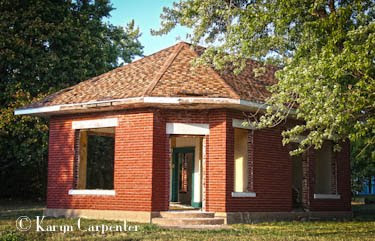 The little brick building is simple but has a special kind of character. Set on a corner at the edge of our downtown district, it has housed various small companies through the years. The smell of baking goodies has filtered through its cracks when it held bakeries. People insured their homes and families within its walls. Originally, it was the office for a lumber yard, and at one time, if memory serves, it may have been home to a phone company. Or maybe not. The walls hold tight some of the secrets of its past. This town was once beautiful, with old brick buildings lining its main streets, and stately homes gracing her neighborhoods. It used to be a town that people were proud to call home. But, slowly it has lost its charm. Sheet metal covers many of the downtown building facades, and when you start to look closely, you notice that the roofs of many of the stores have simply caved in from neglect. Business signs are tattered. If a town could speak, you would hear it whispering, "what happened? Why does no one care any more?" "What is to become of this town?" I ask person after person in power and in the know. "In five more years, there will be no town left to preserve. What of the buildings that are falling in?" "We'll probably wait a while, then knock 'em over," is the standard reply. My heart skips a beat. While I haven't lived here for years, this is still home and every time I return to see a little bit more of it covered in metal or caving in - - every time I talk to someone who can't see beyond the end of a bulldozer, a piece of me dies. We live in a throw-away society. I know that. Not being much of a consumer myself, I don't understand it, but I know that it is true. Everything Americans buy is made to quickly be outdated and no longer of use, or replaced by something bigger and better. So, the bulk of our society revolves around our need to consume, and consume some more. But, when this town is gone, when its history is knocked over "just because it is easier than preserving it" - then what? People bemoan the fact that "things aren't like they used to be!" "No one wants to live in a small Kansas town anymore," people say. But, I have to ask, "What is the draw? A town is judged first by what people see when they drive into it. Who wants to stop and stay in a tin-can town? If what people see sends the message that no one cares anymore, then why would someone stop for a cup of coffee, a burger? Why would someone look at starting a business here, or buying a home for their family?" My parents, grandparents, great-grandparents, all rest at the local cemetery. And, even there, what was once a charming place to rest for eternity is now marred by the erection of a metal building. The long history of Carpenters in this town ends with the passing of my mom, but for a while I thought I might take up the mantle, try to inject some life into the town. I think outside the box, perhaps I could make a contribution towards saving this place. But, these are foolish thoughts. And today that spark died in me. As I photographed the charming little brick building in its last moments, a man saw me and asked how I was doing. I told him I was shocked and saddened because the little building was being destroyed. "Oh, that!" he chuckled, "we want the bricks for the church!" he said, and off he went - a happy look on his face. A piece of our history will be gone, but the church will have its new covered breezeway, or whatever…..